Program: Welcome Back; Socialize; Show 'n' Tell "What I Did Over the Summer"
Fat Quarter: Celestial prints: think stars, planets, suns, moons! does not have to be fabric but should be quilt- or sewing-related. Food Pantry: Bring non-perishable food items to be donated to local food pantries! Fat Quarter: "Things That Move"
Program: Allison Wilbur (rescheduled from March): "Quilting as a Design Element"
Guest Fee for this meeting is $10. 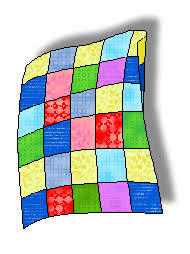 The Truth about Quilt History"
25th at Blessed Sacrament Church in Saugus, 10:00 A.M. If you would like to be an "elf" and help stuff the pillowcases, please contact Gretchen. miles north of Saugus). Optional third night on Thursday, March 22.
limited to 15 people. A nonrefundable deposit of $20 is due at the October 4th guild meeting. ideas for the show, please attend this first meeting of the Quilt Show Committee. Sally Clapp, transfering photos to fabric. $28 includes the bus, admission to the show, water, and fun!